Dixieland, Smooth Swing - we give it both ways. Paul provides groups from 2 pieces to 6 or more. Typically a Dixieland trio would comprise clarinet, banjo and tuba - includes vocals. A smoother style trio could include guitar and double bass with saxophone, clarinet or flute. To these combinations can be added drums, piano, trumpet, trombone, vocalist, etc. Ideal for business conventions, restaurants, weddings, parties, hotels, clubs, dances, concerts, shopping complexes, etc. Paul Furniss has been a professional musician in Sydney for over 30 years - this includes long and continuing associations with such musicians as Graeme Bell, Tom Baker, Geoff Bull, etc. 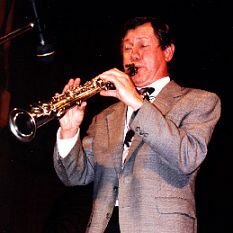 Paul has accompanied visiting jazz artists and made several overseas tours with performances at festivals in USA, UK, Switzerland, New Zealand. At home he has played most festivals including Manly, Wangarratta, Newcastle, Melbourne, Perth and Bellingen.